1. High priest in the reign of Josiah (II Kings xxii. 4 et seq.). 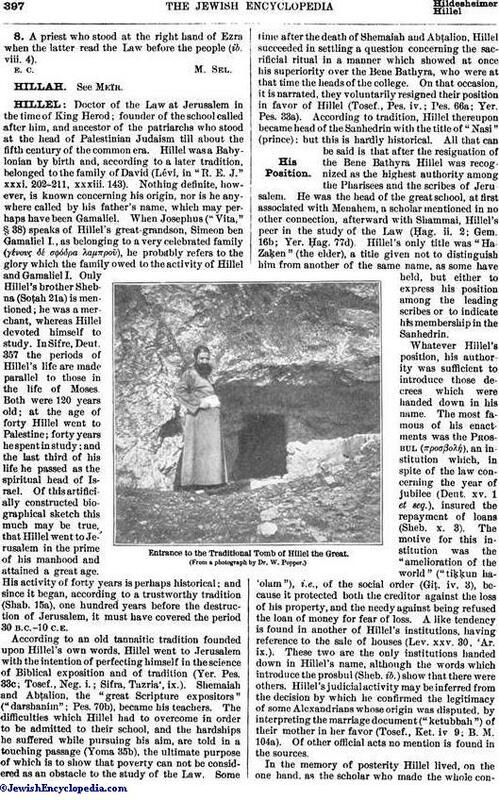 It is probable that he was the Hilkiah ben Shallum who figures in the genealogy of high priests in I Chron. v. 39 (A. V. vi. 13), and that he was, consequently, father of Azariah and great-grandfather of Ezra the Scribe (ib. ; Ezra vii. 1). Ḳimḥi and Abravanel (to Jer. i. 1), however, give his father's name as "Shaphan. "Josiah commissioned Hilkiah to superintend the repairs of the Temple; and it was when the latter took the silver from the Temple treasury that he found the scroll of the Law (II Kings xxii. 4-8; II Chron. xxxiv. 9-14). Hilkiah gave the scroll to Shaphan the Scribe; the latter read it before the king, who, terrified by the divine warnings, sent Hilkiah with four other high officials to consult the prophetess Huldah (II Chron. xxxiv. 20 et seq.). 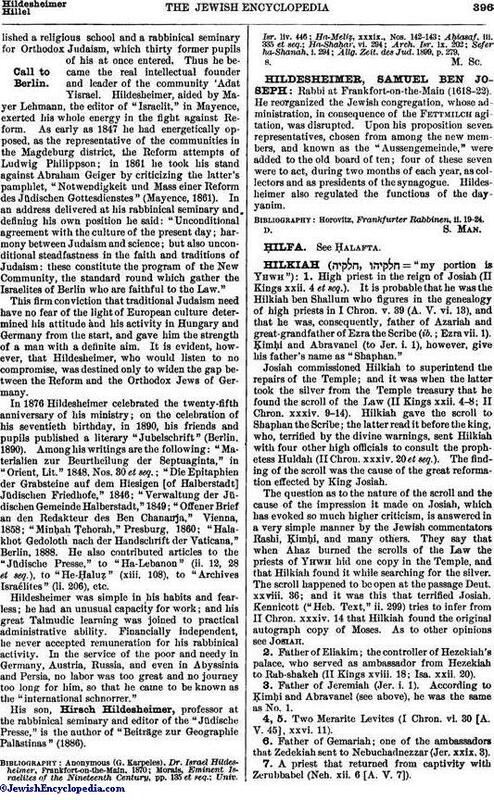 The finding of the scroll was the cause of the great reformation effected by King Josiah.The question as to the nature of the scroll and the cause of the impression it made on Josiah, which has evoked so much higher criticism, is answered in a very simple manner by the Jewish commentators Rashi, Ḳimḥi, and many others. They say that when Ahaz burned the scrolls of the Law the priests of Yhwh hid one copy in the Temple, and that Hilkiah found it while searching for the silver. The scroll happened to be open at the passage Deut. xxviii. 36; and it was this that terrified Josiah. Kennicott ("Heb. Text," ii. 299) tries to infer from II Chron. xxxiv. 14 that Hilkiah found the original autograph copy of Moses. As to other opinions See Josiah. 2. Father of Eliakim; the controller of Hezekiah's palace, who served as ambassador from Hezekiah to Rab-shakeh (II Kings xviii. 18; Isa. xxii. 20). 3. Father of Jeremiah (Jer. i. 1). According to Ḳimḥi and Abravanel (see above), he was the same as No. 1. 4, 5. Two Merarite Levites (I Chron. vi. 30 [A. V. 45], xxvi. 11). 6. Father of Gemariah; one of the ambassadors that Zedekiah sent to Nebuchadnezzar (Jer. xxix. 3). 7. A priest that returned from captivity with Zerubbabel (Neh. xii. 6 [A. V. 7]). 8. A priest who stood at the right hand of Ezra when the latter read the Law before the people (ib. viii. 4).